Unprecedented pressure being applied to operations leaders to drive more value, without huge investment increases, is forging a dire need for the vast majority of service buyers and their providers to change how they work together. The legacy model of "we pay, and you deliver for cheap and we don't really want you getting involved with helping us do things better" has to change. 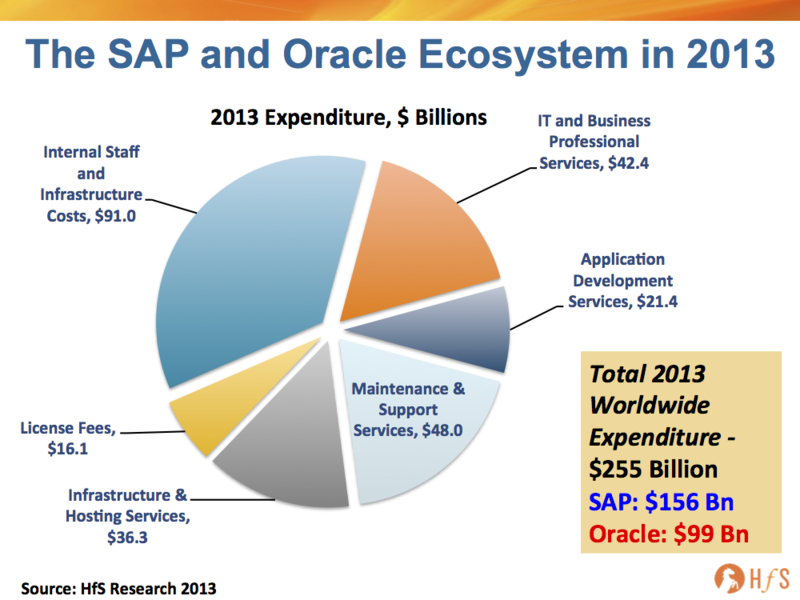 Otherwise, enterprise leadership will find new service partners and operations heads to take them forward. So we set out on a unique Blueprint research exercise, led by myself (Phil Fersht) and supported by HfS analyst Hema Santosh, where we interviewed a host of enterprise clients on their experiences with Design Thinking exercises with their service providers, using our new Blueprint Methodology to assess their innovation and execution performances. Many of these clients were not the usual rose-tinted reference clients heavily wined and dined by the providers - they were from the HfS buyer community, who could give us an unvarnished, honest appraisal of their Design Thinking exploits. We focused on those leading service providers, currently involved with Design Thinking as a key component of their As-a-Service delivery model. While we acknowledge there are many design boutiques and consultancies out there, we specifically focused this Blueprint on the capabilities of the leading outsourcing service providers. 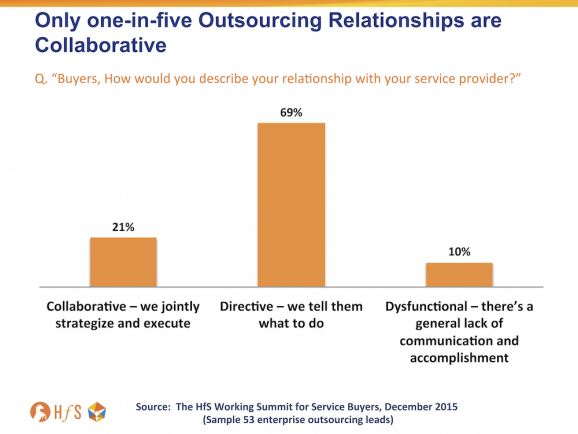 Phil, why is Design Thinking so relevant to the future of outsourcing? Digital technologies, robotics software, analytics tools, BPaaS platforms and artificial intelligence can only be effective and impactful once enterprises have re-designed their processes in a way that drives them towards their desired business outcomes. This has always been the case with (now legacy) ERP implementations, where thousands of clients have blown billions of dollars on enterprise software they simply never could mold effectively to their businesses. They weren't finding problems to solve, they were creating new ones they didn't need in the first place. It's the same with the next wave of As-a-Service solutions - they will fail without the right approach to designing processes that produce the desired results. In short, "As-a-Service" is about a business model transformation - and how it can be empowered by digital technology, made more effective and intelligent by automation and cognitive computing, made possible by smart change management and made trustable by proactive security deployment. Hence the need to design this seismic change, in terms of both talent and solutions, is what holds the keys to the promised kingdom. Without Design Thinking, enterprises are really just retrofitting expensive solutions into legacy processes and likely wasting a whole load of time, resources and money. It all starts with Design Thinking. Design Thinking, and new creations of Design Thinking-eque collaborative methods, are increasingly important ways to bring together new concepts and ideas, better teamwork, and ways to design outcomes jointly that can incorporate investments from both sides. What are you seeing on the service provider side for engaging with clients with a design mindset? We’re seeing encouraging signs from several providers aggressively promoting Design Thinking techniques, such as our early leaders Infosys, IBM, Cognizant and Accenture (see above), into their engagements, but this is still restricted to far too few a number of buyers at this stage. We have been impressed by the focus from Infosys, where their CEO has personally hired a team under Sanjay Rajagopalan to train all staff on Design Thinking methods and embed it into all RFPs over $50m in value and drive some significant engagements worldwide across both IT and business process areas. IBM has made significant investments in its global centers, with over 600 designers working in 20 schools worldwide and has engaged its entire leadership team in Design Thinking workshops internally. Cognizant impressed us greatly as a firm where a design mentality is native to its hyper-development and growth in recent years - and its determined focus on digital has Design Thinking at its core. Accenture has made recent investments to infuse Design Thinking into its engagements, which is a unique challenge for a firm that has evolved with a client/partner model, but we were, nevertheless, encouraged by the significant investments being set aside by its operations group, with specific focus from its strategy lead, Michael Corcoran, to As-a-Service model with a Design Thinking ethos. We also saw determined efforts to develop a Design Thinking mindset from other leading service providers during our study, such as Genpact in F&A and its Lean Digital approach, which has a real tie-in to Design Thinking. Infusing design concepts into a function as slow-moving as F&A is challenging, but Genpact is one of the most proactive providers in the market in pushing its clients hard to re-imagine their finance and procurement processes to be more effective. Wipro's acquisition of Designit has advanced its Design Capabilities in digital areas and its new CEO, Abid Neemuchwala has come from a heritage of rethinking roles and capabilities from his time building up the TCS BPS business. Sutherland Global Services' focus on providing Design Thinking engagements in marketing and customer support areas has been impressive, which includes two of the largest technology firms in the world. In addition, TCS has been pushing various flavors of Design Thinking for sometime, especially with financial services clients, while EXL's EXLerator framework incorporates elements of Design Thinking and promotes the mindset with its ambitious clients. Other providers we expect to see emerge in the future include Concentrix, an innovative leader in the contact center space and Capgemini, which is busily integrating its IGATE acquisition, but has some real potential, especially with its global process model and robotic process automation. And where does Design Thinking fit into the As-a-Service continuum, Phil? Being successful in the As-a-Service Economy requires ambitious service providers to make fundamental changes to their whole approach to service design and delivery. At the heart of this evolution, is a shift to service solutions being designed with real business context, as opposed to simply “looking at a process”. This involves a genuine focus on approaching and interpreting a client’s challenges, identifying and experimenting with opportunities, and ultimately evolving these approaches into the service delivery. HfS believes that "traditional" capabilities, such as Six Sigma-based process design and execution, while essential to delivering the efficiency benefits of traditional sourcing, are today standard, commodity-based capabilities embedded into any standard service delivery model. We believe that a new Design Thinking methodology must be front-and-center that imbues the full spectrum of human-centric design ethos. HfS' Design Thinking methodology is based upon a more responsive relationship between the service buyer and the provider, one that is open, empathetic, experimental and yet efficient. We firmly believe 2016 to be the year in which Design Thinking comes to the forefront of the sourcing and services market. It will be the time during which service provider leadership teams are sent to design camps, and a whole new set of conferences and workshops feature Design Thinking as their theme of the moment. Some of that may be hype or even unnecessary, but at the root of it, the arrival of Design Thinking into the mainstream of the IT and BPO services world makes sense to us as a way to re-imagine more effective process-based solutions for this increasingly digitized As-a-Service world. So what are the key takeaways you would like to leave people with, before they download the report? 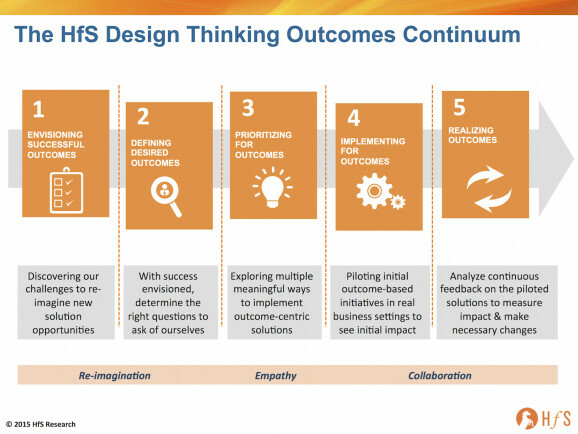 Design Thinking for outcomes is a real methodology that enterprises can understand and embrace today, as opposed to five years' time. However, while we believe Design Thinking will firmly take root in IT and business services in 2016 as a methodology to drive genuine collaboration and creative ideas, at the end of the day, it is still just another tool. What you make of it depends on the intent and practices of its users, whether individuals or organizations. This approach will not be easy for some legacy service providers who cannot yet see how the world is changing - or can see it but are paralyzed to do anything about it. For those service providers and their enterprise clients which can see that thriving in the As-a-Service Economy requires new approaches and capabilities, we see a real potential to use Design Thinking in the move from the present into the future. Getting new digital processes and services right from the perspective of their end users is critical, especially as this is really about a business model transformation that is enabled by digital technologies. Design Thinking, which is about context and empathy for the user, can facilitate this focus. It will be an integral part of the emerging As-a-Service provider offerings, many of whom are already rapidly emerging to redefine the market. HfS readers can click here to view highlights of all our 30 HfS Blueprint reports. See our plans for 2016 Blueprints here. 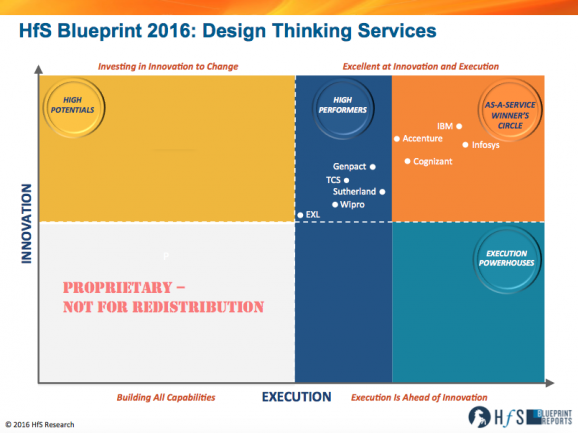 HfS subscribers click here to access the new HfS Blueprint Report, "HfS Blueprint Report: Design Thinking Services, 2016"
Phil and team, excellent analysis on Design Thinking, which really takes the old steady-state Outsourcing model and says 'How can we infuse new thinking - to your point, designing in - into the As-a-Service process'. Great article. I especially liked this quote: "Without Design Thinking, enterprises are really just retrofitting expensive solutions into legacy processes and likely wasting a whole load of time, resources and money." Hi Phil & Team, Truly this is excellent article by you / your team, and explained as how Design Thinking is into the mainstream of the IT and BPO services world and makes sense to us as a way to re-imagine more effective process-based solutions for this increasingly digitized As-a-Service world. I guess we were too early on the curve (maybe the curve didn't even exist in 2004) that Continental AG and Ideafarms (my company), collaboratively designed and executed the smartsourcing model that we managed to run successfully till Continental was bought in 2008. An added challenge we faced was that of working between India and Germany, then between India and Continental's US, EU, Malaysia offices that have completely different social and work cultures. Exciting times. Wish they had lasted longer. I don't think any other company (emphasis) has has the richness of experience we had: from Continental's perspective, no company has extracted as much strategic business value. I believe Design Thinking is showing the way to a path we've already trodden. We have seen the future and believe me, it's blindingly bright! Thanks for a beautiful rendering Phil, of the great things to come. Happy to share our experience with your world.